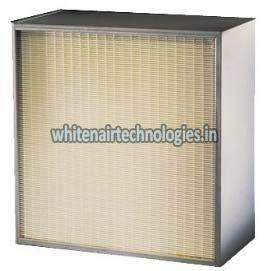 We are ranked amongst the prominent Manufacturers & Suppliers of ULPA Air Filter from Telangana, India. Our Air Filter is precisely and efficiently designed by professionals in fully equipped facility who adhere to the latest fabrication methods. We have developed a strong distribution network to ensure swift delivery of ULPA Air Filter through the length and breadth of the country. Filter Frame: Anodized Aluminium, SS 304.